Asteroid ring: Chariklo is the first nonplanet found to have a ring. 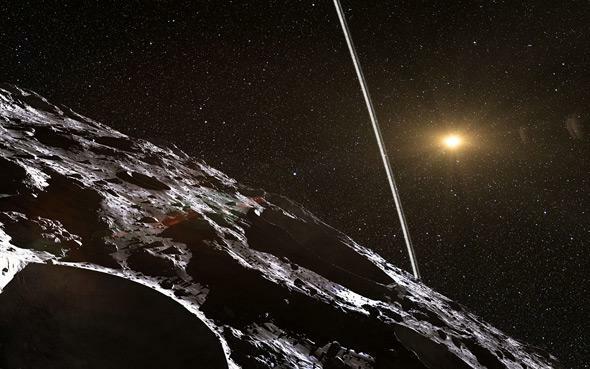 A New Ring System Found in the Solar System … Around an Asteroid! Artist drawing of Chariklo and its rings. Click to sagittarianate. Quick, how many objects in our solar system have rings? Not so fast. Meet Chariklo, the fifth member of this exclusive pentaverate! Chariklo is what’s called a centaur, one of a family of objects that orbits the Sun out past Jupiter. These are weird beasts; they’re rocky bodies similar to asteroids, but some have been seen surrounded by a fuzzy halo of gas that makes them look more like comets. This is why they’re called centaurs, in fact; half one thing, half another. There are probably a few tens of thousands of centaurs orbiting the Sun out there, and Chariklo is the biggest known. It’s about 260 kilometers (160 miles) in diameter, and most likely composed of a mixture of rock and ice. It’s far too small to ever be seen as anything other than a dot by Earthbound telescopes … but sometimes things align to unveil more information about distant objects. Literally, in this case. 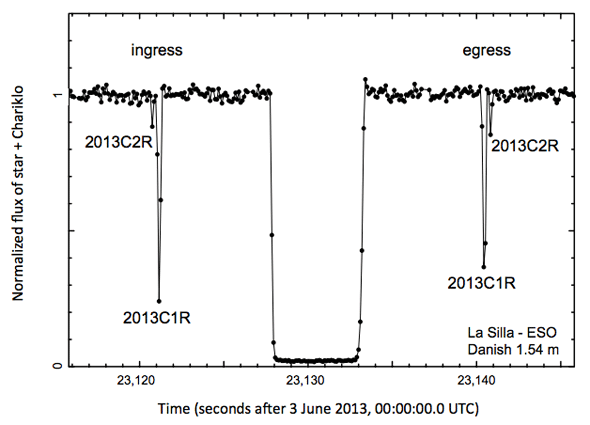 A few years ago it was predicted that Chariklo’s movement around the Sun would make it pass directly in front of a relatively bright star (called UCAC4 248-108672, if you’re interested) on June 3, 2013. These are called occultations and are relatively rare but important events; by timing the duration the star is blocked, the diameter of the object can be determined. If you have several observatories at different locations watching, a rough shape of the silhouette of the object can be constructed, too (since they see different parts of the object passing over the star). The Chariklo occultation would only be seen from South America, which put it in the path of several telescopes. When the evening came, they were trained on the distant star, waiting for it to blink out as an icy asteroid blocked its light. The actual observations of Chariklo show two pairs of dips on either side of the main occultation, and they are mirror-images of each other … the tell-tale signature of a ring system. Graph by Braga-Ribas et al., from the journal paper. What they got instead were a series of dips in light! The star faded five times in all; it was blocked completely by Chariklo itself, but before and after the main occultation were a pair of fainter ones; a weak one, then a strong one, then the main occultation, then a strong one, then a weak one. At first you might suspect the centaur has moons; we know many asteroids have them. But look at the dips; it would need four of them, exactly lined up, with two small ones on the outside and two big ones orbiting Chariklo closer in. That’s way too much of a coincidence to ask for. Far more likely is that Chariklo has rings. Planetary rings are made of tiny particles like ice or rock which orbit the planet in tracks that can be narrow or wide. In the case of Chariklo there are two rings seen; a narrow one about 3.5 kilometers (2 miles) wide orbiting about 405 kilometers (250 miles) out from the planet, and a broader, thicker one about 6.5 kilometers (4 miles) wide orbiting a bit closer, 390 kilometers (242 miles) out. The broad one has about 12 times as much material in it as the narrow one, which is why it blocked more starlight. The observations look quite good, and in my opinion these rings are real. That’s remarkable! Chariklo is by far the smallest body in the solar system known to have rings. The obvious question is, why does it even have them? And why two? 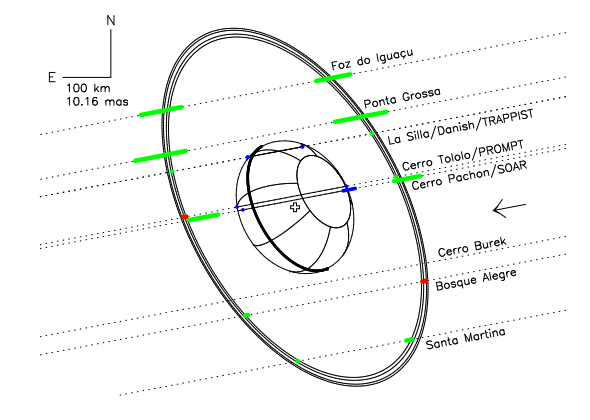 Schematic of Chariklo and its rings, based on the occultation observations. The dotted lines show the shadow path over various observatories, and the green lines are the observations showing the locations of the rings. (The drawing is a best fit to the observations.) Note the shape of Chariklo itself (shown in the centaur), which is flattened. The most likely cause is from a collision; some smaller body may have slammed into Chariklo, creating a huge cloud of ice and dust that encircled the centaur. Due to complicated physics (including the fact that from the occultation observations it looks like Chariklo itself may not be spherical, but oblate, like a beach ball someone sat on) the particles could settle into a disk, orbiting the main body above its equator. I find it very interesting that there are two rings, though. The starlight dipped a bit, then went back up to full brightness before dipping again, indicating there is a clear, clean gap between the rings, too. That strongly implies that Chariklo has a moon! As the moon orbits its parent, its gravity can constrain the rings, keeping them narrow and well-defined; this is called shepherding, and we see it in Saturn’s rings. From the occultation data, the moon would be tiny, only about a kilometer (roughly half a mile) across. Interestingly, over time several processes would tend to make the ring spread out, eventually evaporating it in a few million years. So either the rings are young or there is a moon corralling them (or both). The presence of the moon seems pretty likely then. Not only that, but spectra of Chariklo taken over time have shown the presence of ice. A few years back that signal weakened, and no one knew why. This may have been due to the rings: They are composed of icy bits, and these new observations indicate that during that time they would’ve been edge-on to us on Earth. Normally we see them more like Saturn’s rings, more open and face-on to us, but for that brief period they would have appeared very thin, and their icy signal diminished greatly. Looking back on all this, the astronomers who observed the occultation sure got more than they hoped for: the size and shape of Chariklo (as expected), as well as not one but two rings, and hints that there may be a tiny moon in orbit as well! Fantastic. And we find all this because a scrap of ice and rock cast a shadow across the Earth, momentarily blocking the light from a far, far distant star. There is poetry in astronomy, certainly, and its words whisper to us about the stuff the Universe is made of. If you can read them, you can learn amazing things. *You might think the Sun has a ring: the asteroid belt. But the shape and dynamics of planetary rings are dominated by collisions, whereas asteroids are too far apart, making collisions extremely rare. I don’t think it counts then.